Rounds 6 of the series already. 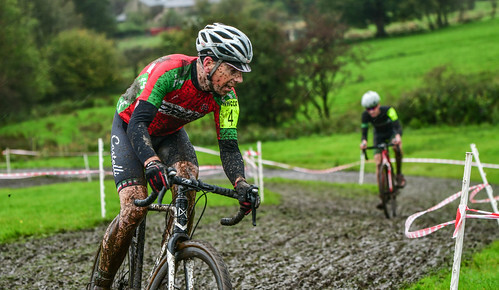 This season is just flying by – thankfully there’s loads of races left, because so far it’s been a proper cx year. Mud. Hard racing against great people at really good events. You could not ask for more. Not that Sunday’s result was totally my fault; a sliced open tub left me trying to ride the tricky/rooty descent and following off camber sections on a pan flat front tyre (which still didn’t come off, might I add, showing off my gluing skills 🙂 ) and a jammed front mech on the other bike meant I lost a fair chunk of time. 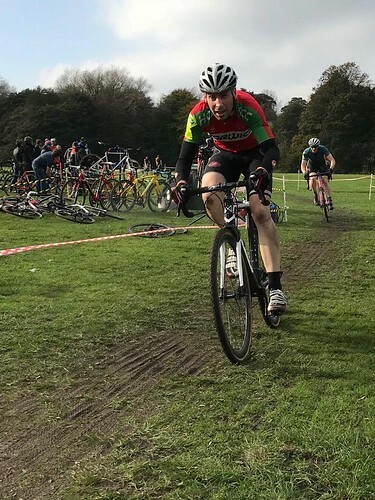 I’d fought my way up to 2nd for a while (even with the crashes and generally crap riding) but couldn’t get any sort of advantage and ended up 4th. Bit gutted, but fair play to Tom and Adam who both just out rode me (and fair play to Martin who rode off for the win). I will never tire of telling people they filmed some of Chariots of fire at the Bebington Oval, where Sunday’s race was. Never. Even people who a) already knew and b) I’d told before, even though they already knew before I told them for the 1st time. They filmed some of Chariots of Fire there, you know. A bit of pre race course examination revealed the usual nice mix of long straights interspersed with some lovely swoopy (and suprisingly tricky) corners, making the most of any cambers. As per usual, by the time us Seniors got to race on it, it was looking quite “bedded in” in places, with a couple of the straights now ankle deep running sections and a few utterly brilliant ruts appearing in the corners (who doesn’t love railing a rut like the pros eh!). Proper ‘cross. The race itself was a tad frustrating. A naff start, but getting back on terms with the front group within half a lap, then trying to ride when I should have just run dumped me further back that I’d have wanted, sounds like a repeat of pretty much every week for me so far this year. However usually I’ve had enough power to work my way back up quickly enough. Yesterday I really struggled to get any power going. I ground to a halt in mud that others ere able to keep their pace through. On the faster, drier sections I just couldn’t do my usual big-ring-smash effort to gain any advantage. Enough with the misery though, it was still utterly brilliant. More close racing. Ear to ear grins through the turns, trying to get them nailed faster and faster. Slithering about in the mud, letting the bike drift and catching potential crashes over and over again (apart from one or two…). Cross is totaly boss. 5th and a “could have done better”. The sun kind of shone. It was warm enough for ice creams (with marshmallows on!) to be eaten. Hardly any mud. Much fastness. Lovely! Loads of swoopy up/down/round the trees bits, some flat out across the fields bits, a bit of classic off camber action and the odd sharp corner to brake check each other on. 1st lap. Semi-half decent start. Not struggling to stay in the front gaggle. Down the drop towards the pits, the drop with a sharp right/very sharp left combo, three abreast. The other two leave it to the last minute and dab nicely effective brakes to haul them up to make the turns, I squeeze my brake levers in unison with them…and go sailing on as pretty much nothing happens. Straight on at the first corner. Just about stopped before the course cut back across me, just about preventing an awful t-boning incident with everyone in the top 10. Instantly down to about 23rd place. Bugger it. Rest of the race was spent chasing my way back up through the field with less braking power than any of them. Caught up to the back of a battle going on between Isaac Peatfield and Bruce Dalton, crashed on the off camber (not blaming the brakes for that). Chased back on again. Crashed and whacked the right hand brake lever out of place. Swapped bikes, chased back on for a 3rd time and just about got in front of them on the last lap after some utterly brilliant close racing. Ace stuff. Only downer on what really was some great fun racing was the whole “what could have been if I had decent brakes/didn’t bin it so many times”. A new venue for this year, at the Chipping Showground. Somewhere I’ve ridden past countless times on the way/from the Bowland hills and often wondered about; what was contained behind the gates…and now I know. Mud. Lots of it. After somehow avoiding eating my own weight in delicious smelling, freshly cooked food and cake I pottered round the course before the racing began. The phrase supermodder immediately came to mind! Lots of lovely flowing corners, some excursions into the woodland and some up-y down-y grass banks that I’d never spotted before, all lovingly coated in a thick layer of slimey mud. Ace. By the time my race set off it had been churned up royally by all the vets/women so had a fair amount of running in it, but those corners still flowed quite well and, hey, it’s still racing! 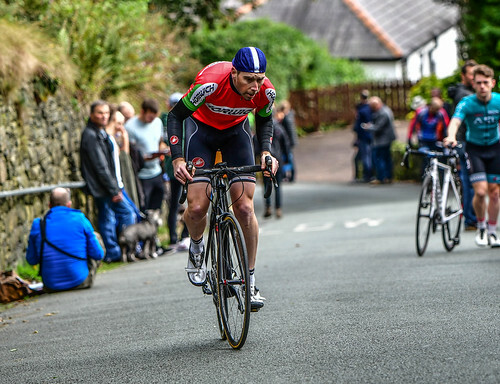 Sunday saw a return to The Rake in Ramsbottom for the annual hill climb. 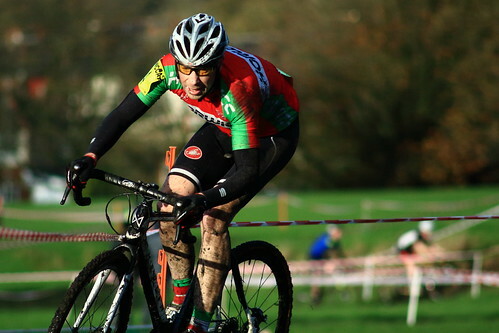 Some say that racing cx the day before is not the perfect lead into a 2 minute flat out effort. I tend to agree. Thing is, it’s such a good event it’s worth doing no matter how sore your legs/whatever else you crashed onto is/are. The atmosphere as you take the right turn onto the steepest slopes is amazing – a genuine crown, 2 or 3 deep in places screaming at you as all the blood rushes from your head and your legs truly start to pop. Just ace. Didn’t race the 3 Peaks this year. Felt like I needed a year off it, to get the desire back, so this year I just went down to spectate. Saturday night was spent in the pub, rather like Sunday afternoon usually is, have a few beers and talking crap. Sunday morning dawned, which was damned annoying in itself as I nursed the worst hangover ever in the history of the world, so I didn’t even bother going to see the start of the race and set off to spectate late. Luckily the ride round the bottom of each of the Peaks to see people finish each descent brought me round and by the time Angela and I get to the base of Pen y Ghent the aching had subsided and my head felt much clearer…sort of the opposite of racing! Post race saw me not drink anything at the pub and get an early night, so there you are, the 3 Peaks in reverse! Round 2 of the NW league took place the following Saturday, organised by Weaver Valley CC. I like their course, mostly flat, with a few long straights to lay lots of power down, but a nice trip into the woods each lap with a “fling yourself down it” descent and a “get off and run it” re-emergence from the trees. 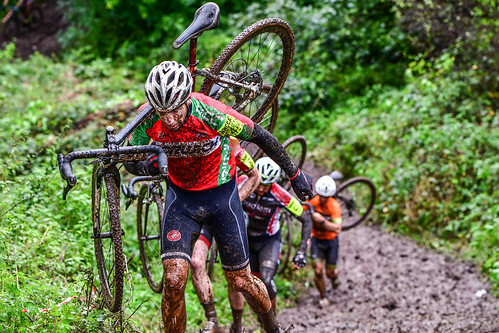 All good fun and a proper cross race course to get stuck into. They even provided shedloads of mud and some full on winter style pouring rain to race in! I had a cold, but bravely soldiered on…telling everyone about it…making a few mistakes early on – losing a half decent start by nearly writing my front wheel off stuffing it into the rear disc rotor of another rider as we sprinted away from the whistle, ripping my race number off and having to stop and find it in the mud, that sort of thing – but getting stronger as the race went on. I eventually finished a snot covered 6th. Still lots of ground to make up over the course of the season, but a decent enough finish given how I felt.